The Peg Perego Pliko P3 Compact is a stylish, yet functional stroller completely loaded with features for your convenience and baby’s comfort. The company has added the name “Compact” to the Pliko P3 because it has recently been redesigned to fold smaller by an additional two inches, without losing any features of a full sized stroller! Installation: Out of the box all I needed to do was open it up, pop the wheels on and attach the snack tray and storage basket. Wheel installation is fairly straight forward as the front wheels have a circular snap-on and the back are oval. Once on, a quick turn of the lever on the front wheels is all that’s needed to lock them into place. Getting started: Opening the stroller is a breeze. Simply pull the two levers on the handlebars upwards and at the same time, lift the chassis and it will open automatically. Features: The stroller seat features the signature Peg Perego 5-point harness that allows parents to keep “active” children strapped safe and securely in the seat. It has a fully supported, four-position backrest that reclines flat with an easy one-handed motion designed to not disturb your child once they’ve fallen asleep. Having support for little legs is important, both for healthy circulation and for comfort, and the Pliko P3 Compact has a two-position leg rest, either up or down, and it really makes a difference. 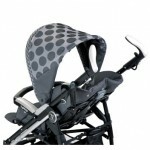 The Pliko P3 stroller has one of the most unique sun canopies I’ve seen. The leather trimmed hood unzips into an airy “follow the sun” sun canopy by just unzipping the back of the hood to get some full air flow, while still keeping your child shaded. I’m impressed by the generous size of the canopy. 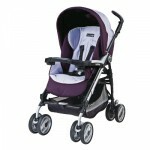 When the seat is upright, the canopy goes almost as low as the child tray, which is great for protecting your child from the sun, wind or rain. It also has a peek-a-boo window and storage pocket, adding a nice touch for both child and parent. You can also hang your child’s favorite toy from the special loop underneath the canopy. To accommodate parents of all heights, the Pilko P3 Compact has ergonomically designed telescoping handlebars with extra padding compared to its previous design. As a tall(er) woman I love this feature, as it allows for a more comfortable push and I’m not kicking the wheels all the time. Your newborn baby can also travel in comfort and safety because the Pliko P3 is car seat-compatible; just pair with a matching Primo Viaggio Car Seat (sold separately) and you have a fully functioning travel system. In Use: Its aluminum frame is light yet strong, making it easy to carry and durable enough that it can last for more than one child. The strong aluminum frame allows a child up to 45lbs to ride and the extra weight the P3 has makes it sturdy enough so that even when your child is not in the stroller, a large purse and a few shopping bags can still hang off the handlebars without causing it to tip backward. The storage is more than ample on the Pliko P3 – it has a nice large basket, where moms can store baby essentials, such as a diaper bag, toys, bottles, and more. While you can’t access the basked from the rear you can easily access it on either side of the stroller. Aside from the basket the Pliko P3 features a child tray that keeps sippy cups and snacks within reach. The tray can be swiveled outward or detached completely which makes clean-ups a breeze. It also comes with a parent cup holder can be attached on one of 4 knobs on the chassis and can fit most cans or small bottles. Having children means that you’re going to have accidents and spills; like other Peg Perego strollers the fabric on the Pliko P3 Compact wipes clean easily. 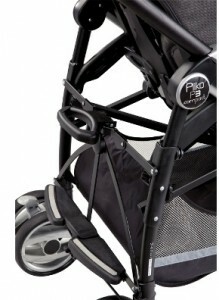 The Pliko P3 has all-wheel suspension to provide a smooth ride for your child. You can set the front wheels to swivel for easy steering and turning or lock them into place for straight long distance strolls. We live in a rural area and the stroller handled well on the pavement and some of the more bumpy conditions in our neighborhood, but I wouldn’t suggest it for all terrain (gravel roads, choppy ice conditions, etc) as you’ll likely find it to be a bumpy ride. If you have an older child who normally walks but occasionally needs a little break, Peg Perego was thinking of you in their design as well. 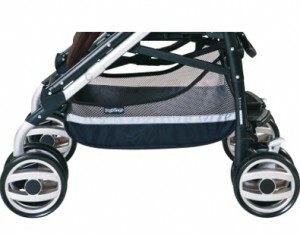 The rear foot board, between the back wheels, has been designed to help a parent overcome small bumps or carry a second child. Busy parents will appreciate that the Pliko P3 Compact features a one-hand fold. It allows easy, quick closing and carrying, and being lightweight, it is the perfect stroller for traveling by air or public transportation. It also folds very compactly and stands on its own when folded, which makes storage a breeze. With 10 types of fabric and style combinations, it’s lightweight compact design and affordable pricing at approximately $350.00 the Pliko P3 Compact is the preferred stroller for stylish, modern moms.